Good morning, Honey!! Today is Snickerdooooooodle day!! I just loooooove them (my honey and the snickerdoodles…)!! Preheat the oven to 180 °C. Line baking sheets with baking parchment paper. Sift together flour, baking powder, baking soda, and salt. In the bowl combine butter, oil, and 1 1/2 cups sugar and beat until fluffy. Add eggs, and beat to combine. Add dry ingredients, and beat to combine. In a small bowl, combine remaining 1/4 cup sugar and the ground cinnamon. Make balls of 1 Tbsp dough, and roll in cinnamon sugar. Place about 5 cm apart on the prepared baking sheets. Bake about 10 minutes, rotating the baking sheets after 5 minutes. Surface of cookies should crack. Let cool if you can fight off the others in the room (which I apparently couldn’t as you can see in the picture). 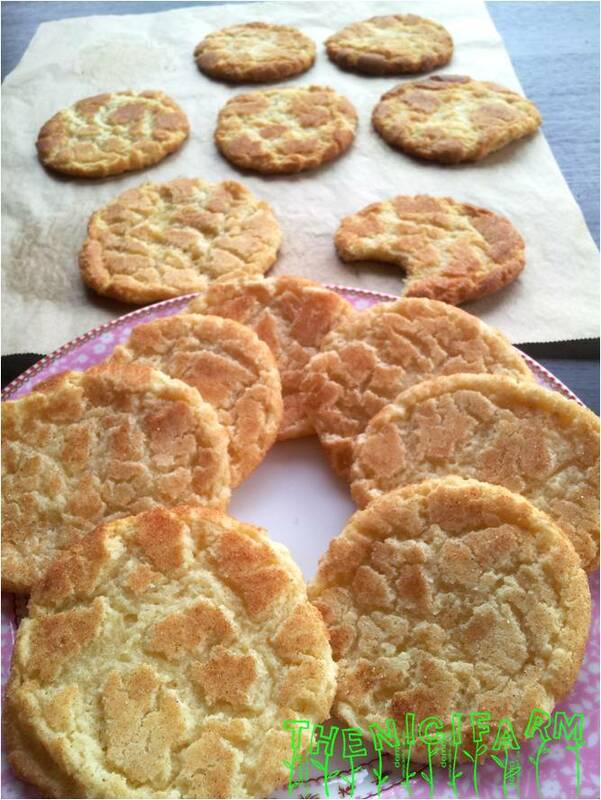 The Snickerdoodles look raw when done and are very soft. When they cool they become hard and crunchy. Trust me and just wait untill they are cold! Store in an airtight container up to 1 week. « The first “THE NICI FARM” Workshop! !